Naïve 19-year-old Suzuo is in search of a part-time job when he runs into Tanpopo, a girl who is actually a humanoid alien. Claiming that she works for a toy company, she offers him a job testing a costume for the character Dokkoida. But she's really working for the Galaxy Federation Police, an organization looking to test power suits for their own peacekeeping forces. Before he knows it, Suzuo beats up a giant robot and moves into an apartment building with other suit-testers - only none of them know they're all doing the same job! 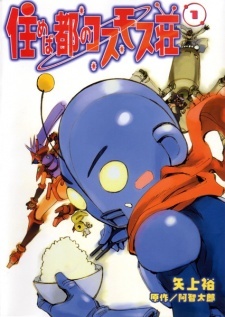 Sumeba Miyako no Cosmos-sou was initially serialized in Dengeki Animation magazine but moved to Dengeki Comic Gao after its discontinuance. The series was published in English as Dokkoida?! by CMX Manga from February 13, 2008 to September 2, 2008.